Before you go and scowl about a “live” album, hear me out. Even in an interview, Fernando expressed his displeasure with live albums. This is a bit different. That is factual, it actually differs from typical live albums. Recorded at Campo Pequeno arena in MOONSPELL's hometown of Lisbon on February 4th, 2017. “Lisboa: Under the Spell”. There is also a Blu-Ray DVD that has the show and a documentary included. “Lisboa: Under the Spell” from Portugals MOONSPELL was released August 17th, 2018 via Napalm Records. This marks the bands 14th official release. Consider “Lisboa: Under the Spell” a little snack to tide you over. While they are currently out on tour the band has no plans to rush another studio album. Word is not until 2019 or even early 2020. “Lisboa” consists of 3 albums played live. I stop at saying in there entirety because 1 song is missing. “Subversion” from “Irreligious.” Aside from that “Wolfheart” and “Extinct” are all there. The set begins with a two-minute intro. The most awesome aspect is the mic-ing technique and placement. You can make out individual audience members with crystal clarity. The actual anticipation is captured. You stand around for an hour and then the house music volume starts to drop, the lights go out, and then you still have another 2 minutes before the band takes the stage. The building of that excitement is something you have to be there to feel. Well, not in this case. I felt it in my chest. MOONSPELL, having been around since 1992, are dead on players. And considering how the sound could capture a fart, you’d hear it if they were unrehearsed. Or another band that sounds great in the studio with the help of Pro Tools. Even though you can’t see what is going on, it’s more than apparent that MOONSPELL are total showman. Perfect at their craft. “Alma Matter” captures an electricity shared between the band and the fans. The bands true passion for playing, and how the song has its own meaning to the fans is swapped back and forth like a kiss. The two times I have seen MOONSPELL live, “Opium” ends, and the guitarist will play a couple of bars from “Awake” and then stop. It’s funny and frustrating. Well this time, finally, after “Opium”, they play into “Awake.” It’s a very strong song vocally to execute the sustain of the notes. Fernando does it. Nails it. The intermissions between songs, to a listener who isn’t there as it happens, does get a little mundane. However, in this case, it’s not too bad. The sounds of the venue are captured so well it does feel as if you are there and people are walking by, talking, yelling, whistling. “Raven Claws” shocked me. I do believe that is the same female vocalist that appeared on the album. And I mean appeared. Was there. Not a backup recording due to her absence. And man, that lady has some vocal ability. She nailed it and even added some accenting sustain, and went up an octave. The highlight for me is “Extinct”. Similar to songs found on the never mentioned “Butterfly Effect” album, this track is gripping and solid. The studio version is very full and powerful. A lot of production had to go into it, so I was leary of it live. Thinking it may end up sounding dry or weak. Nope. It was just as intense and full spectrum stereo sound. While MOONSPELL has been very experimental throughout their career they are a gothic metal band. They originated very death metal sounding and applied black metal ambiance and atmosphere by implementing orchestral or symphonic sounding keyboards. However melodic death metal is not fitting and really death metal isn’t either. The only reason for the gothic label is due to the vampiric vocal approach and some of the songs lyrical content. 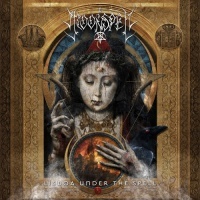 Death metal at times, as there is the use of double kick drums and fast palm muted rhythms with a deep, deep, wicked growling vocal part here and there.MOONSPELL have a very cultural feel to them. It has a style that speaks of their heritage. If you have never been sold on the idea of listening to MOONSPELL, “Lisboa: Under the Spell” would be a great place to start. Not only does it span their first 2 albums and rather than their latest release “1755”, they chose the one prior. Not only can you get a feel for their musical style and ability, but hearing and feeling the atmosphere of this show will have you lined up for tickets when they hit your town.